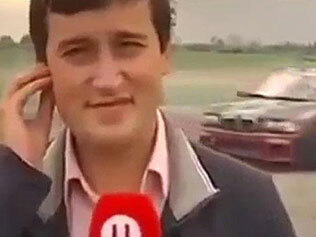 Video A reporter was hit by a car live, SHOCKING! He was presenting a "motor show" in Russia when he was hit. The terrible event occurred when the journalist was making a note quietly and suddenly a car that was behind him, makes a move, such as "kicking", and takes him to meet. It all happened "live and direct." Thank God the person survived the crash and suffered only minor injuries.